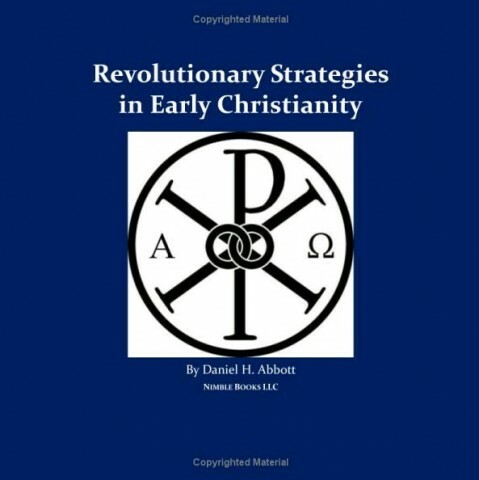 Überblogger and 'blogfriend Dan Abbott has published his first book: Revolutionary Strategies in Early Christianity: 4th Generation Warfare (4GW) Against the Roman Empire, and the Counterinsurgency (COIN) Campaign to Save It. It's on sale now on Amazon. A contributing colleague of mine at Dreaming 5GW, Dan is a dutiful student of the late Col. John Boyd's ideas regarding conflict, decision making and leadership. Dan has done a remarkable job applying contemporary theories of warfare and network science to the early Christian / late Roman era. The most notable strength in Revolutionary Strategies is his inventive correlation of the defensive strategies employed by Caiaphas (the chief antagonist of Jesus’s ministries) to those of Diocletian (the late-3rd century Roman emperor who ordered the most severe persecution of the Christian faithful). Accompanying this analysis is a very cogent application of the theories of Boyd (Penetrate - Isolate - Subvert - Reorient - Reharmonize, or PISRR), with modern examples like Vichy France that match the dynamics in the early Christian church. Both Caiaphas and Diocletian sought to preserve the status quo. For Caiaphas, appeasing Rome was his primary objective: a rogue rabbi who preached of other-worldly gifts would have reflected poorly upon him and his hierarchy. Diocletian clearly understood the management complexities of so vast an empire, and seemed to adeptly address many of the most-pressing ills that plagued the Empire (poor civic participation, an army spread thin on the borders with little to no interior defenses) despite his rampant cronyism (particularly in the establishment of the Tetrarchy). But for the first 18 years of his reign Diocletian was unconcerned about the "Christian threat" – and if it not for Galerius would likely have never ordered the Great Persecution. Dan also provides another benchmark in the evolving theory of the “generations of war”, to wit his development of a taxonomy to differentiate between the various generational constructs. Though I disagree with his assertions that the “0th” (zeroth) generation connotes a form of “total war” and that 3rd generation warfare connotes “better minds”, Dan brings value by identifying possible relationships across the xGW generations and inviting further dialogue. This is perhaps the greatest utility of Revolutionary Strategies: proffering novel ideas in order to provoke debate. Just as the spiritual values of the Romans were initially at odds with the splinter Jewish sect we now call Christians, the different cognitive approaches of Islam and Christianity – one society favoring creativity and innovation, the other cherishing rote memorization – will have similar consequences for our own unfolding century.